Young Soul Rebels as a film I steered cleared of when it was released back in the early 90s. Yes, it ticked a few interesting boxes - soul music, a mixing pot of youth cultures at a turbulent time in British history, a decent plot on the face of it - but the critics were harsh and to be honest, they're rarely too wide of the mark. Saying that, time can often by kind to movies - is it the case here? Well, yes and no. Directed by Isaac Julien and set in the summer of 1977, Young Soul Rebels focuses on two friends and pirate radio DJs (Chris and Caz, played by Valentine Nonyela and Mo Sesay respectively), one straight, one gay and both with ambitions as soul DJs, although not necessarily in the same direction. But the story kicks off in a park - whilst listening to the radio show, a young gay black man called TJ is murdered by a stranger, his radio cassette player stolen and dumped. The police are on the hunt for the killer, a hunt that will eventually take them (wrongly) to Chris. 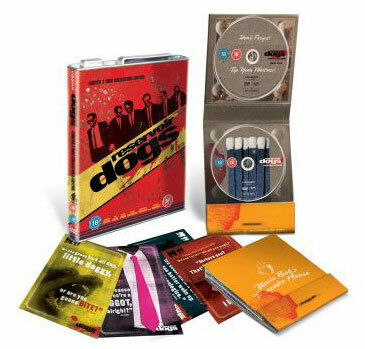 Out this Monday (20th October) is yet another reissue of Quentin Tarantino's Reservoir Dogs, this time as a two-disc Collector's Edition on DVD and Blu-Ray, complete with petrol can casing. You probably know it's the tale of a group of gangsters (with colour-coded pseudonyms), and the aftermath of their failed attempt at a jewellery heist. And it's certainly a movie to own - and this is definitely the version to own. Why? Well, read on over the page for all the extras available here. And if you like what you read, you can pick it up (officially) for £19.99 on DVD or £24.99 on Blu-Ray. Although those prices are heavily discounted at Amazon. 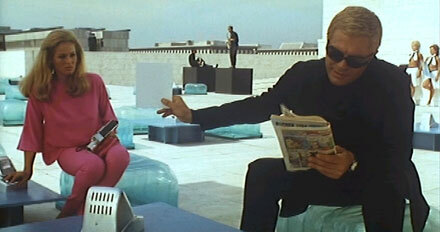 Just bought the latest restored versions of the James Bond movies on DVD? Well, I'm afraid we have some bad news - the James Bond back catalogue is to be reissued in high definition on Blu-Ray disc. Good news if you didn't buy the most recent reissues though - and if you have a Blu-Ray player. According to MGM/Twentieth Century Fox, the new versions have been 'recently restored and re-mastered for the highest quality picture and sound quality via the state-of-the-art Lowry process digital frame-by-frame restoration. And they'll be packed with special features too. The date for your diary is October 31st (same day as the new Quantum of Solace hits the big screen), with the first titles reissued being Dr No, Die Another Day, Live And Let Die, For Your Eyes Only, From Russia With Love and Thunderball. Returning for a second year is the Fashion In Film Festival, mixing talks, exhibitions, newly-commissioned film works, but best of all, some rarely-seen cinema classics that show how fashion of the day was just as important as a good plot and scenery. Some superb films on show this year too, with highlights (for me) including the visually stunning (see image above) 10th Victim (La Decima Vittima) from 1965 and Get Carter (1970) at the ICA, Mario Bava's Blood and Black Lace (1964) at the Horse Hospital, as well as a double bill of delinquency curated by fashion designer and former mod Roger K. Burton (The Violent Years from 1956 and The Boys from '62), Dario Argento's The Bird With Crystal Plumage (1970) at the BFI plus Plein Soleil (1960) and Fata Morgana (1965) Ciné lumiére. Much more besides, including some rare silent flicks and classic US film noir. Check out the full programme at the website - the event runs from 10th - 31st May 2008.